In order to have more control and better quality of our free church video streaming on the internet with the Ustream service, I have been using the single camera version of their desktop encoding software Ustream producer. 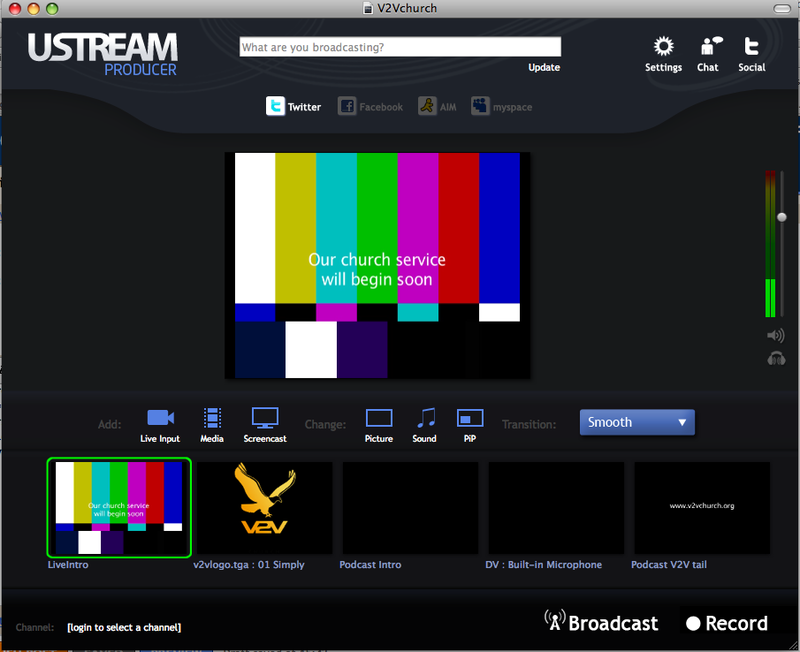 As we already have a cheap non HD church video mixer, the fact that this video software only supports one live feed is not an issue. The main benefits it brings while encoding and streaming our church services is the option to mix multiple sources of other multimedia like pre-recorded videos, pictures or graphic images and sound files with our live feed. I also have the facility to choose our stream encoding options so that bandwidth allowing, the quality of the stream can be made much better than allowed if I was streaming via the web client. The way I currently use Ustream Producer to enhance our live video streaming broadcast is to have a static logo with music playing as the final service preparations are being made so that any early visitors to our web page don't see a blank screen and have to wait till the exact advertised servce time to refresh the page. It also means that if service start time is delayed for whatever reason (usually technical) I don't have to show things still being setup. Once we are ready and the worship team are in place, I smoothly fade to an intro clip also pre-recorded and then transistion to the live service. This job doesn't require an extra hand, but is usually done by the video director. The video below gives an overview of Ustream Producer desktop application which is available in both Mac and Windows versions. We have now updated our church video mixer to HD, but our use of the Ustream producer software has not changed, however recently we had to Stream our event using a mobile phone because of internet firewall issues at the school used for services.